Preliminary Hearing, Stephens County Courthouse in Duncan, Oklahoma, January 4, 1924 (courtesy of Stephens County Historical Museum). The back side of the photo lists principal characters in the hearing, but not in relation to the photo itself. Also, the date is incorrectly listed as December 23, 1923 on the photo’s back. The identification of key characters comes from a copy of this same photo in the Marlow town museum. The Duncan Banner reported that “the defendants were brought down and seated in a row in front of the jury box…” Marvin Kincannon was described in the article as covering the lower part of his face with his hand, while smiling between his fingers. With that description, it is clear that Marvin Kincannon is seated slightly behind two defense attorneys, and to his immediate right is his father-in-law, Fred Stotts, the oldest defendant. This is the only photograph of Marvin Kincannon from the time of the murders as there was no “mug shot” in his prison file from the Oklahoma Department of Corrections. The remaining defendants (in unknown order) were Elza “Roy” Gandy, Byron White, Ollie Loyd, Homer Thompson, and Ellis Spence, seated in a row behind the attorneys; however, we do not have confirmation to match names and faces. From his “mug shot” taken at the Granite Penitentiary, Elza Gandy is thought to be seated between attorneys Womack and Wilkinson, his face turned slightly toward Marvin Kincannon. 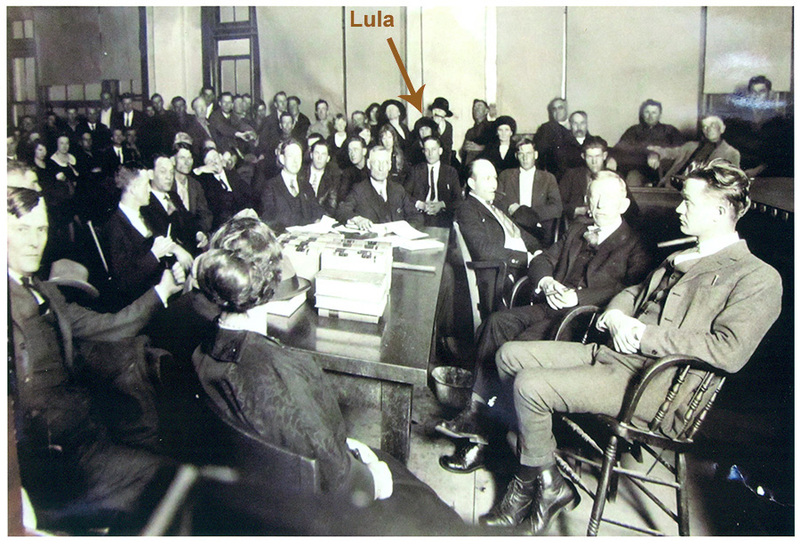 The belated surprise from this photograph was the discovery that Lula can be seen sitting in the jury box (arrow), her face partially obscured by one of the defendants.